1 of 2 In a bowl, whisk together flour, rosemary and salt. In a stand mixer, beat butter and sugar on medium speed until well blended. Reduce speed to low and slowly add in flour mixture; blend until the mixture resembles coarse crumbs. Gather dough into two balls, wrap both tightly in plastic wrap and refrigerate for 30 minutes. 2 of 2 Heat oven to 350 degrees . Remove one dough ball and roll out to 1/4-inch thickness on parchment paper. 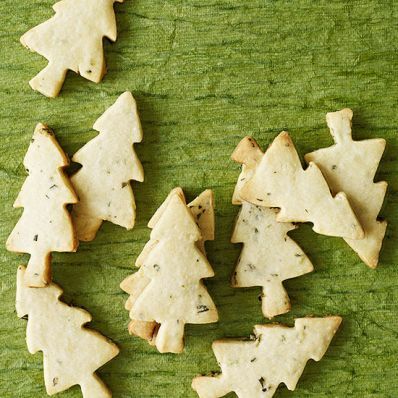 Punch out cookies using a 31/2-inch tree-shaped cookie cutter. Transfer cutouts to a cookie sheet about 2 inches apart; refrigerate for 15 minutes. Repeat with second dough ball. Bake at 350 degrees for 10 to 12 minutes. (Do not allow cookies to brown.) Transfer cookies to a cooling rack.